Blend with cracked ice and pour over one large piece of ice in a punch bowl (shake with ice and strain into a Tiki mug filled with crushed ice). 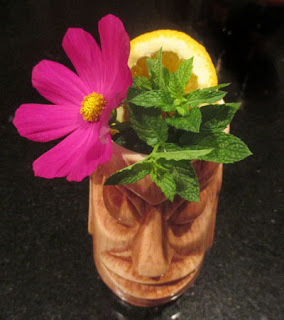 Two Saturdays ago after my bar shift, I was in the mood to make myself a Tiki drink. When I opened up Trader Vic's 1946 Book of Food & Drink, I spotted the Tonga in the punch section. Although it seemed intriguing as written, I needed to scale this recipe down 24 fold to make it more approachable to my small party. Blend with 1 cup crushed ice. Pour unstrained into a glass.